I hope your new year is off to a good start. I have been busy organizing my work room and desk. I needed a place to hold pens, pencils and paint brushes. I came up with a simple solution using the marble base of trophies. A marble base pen holder for your desk! I love the idea of repurposing! It is easy to dismantle trophies. Just unscrew all the parts using a screw driver. 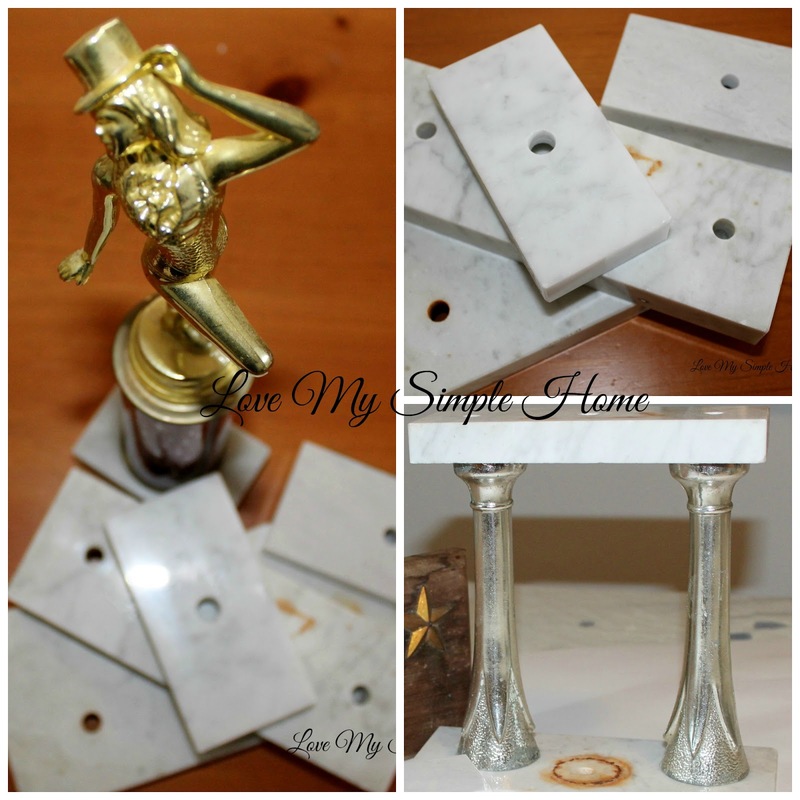 You will be left with all this gorgeous marble and be in marble heaven. Most of the trophies came from yard sales. The fancy girl in the top hat is my daughter's dance trophy she earned when she was about 10 years old. My beautiful girl is now 17 and will be graduating high school this year...Boohoo...I left that one intact... however I did take apart her participation trophy from soccer and repurposed a pen holder for her. I found two pens that fit perfect. Did know that some trophy bases are made from carrara marble? Would you throw that away? Not me, that's for sure! I have seen beautiful kitchen counter tops made from carrara marble. I am dreaming of one in our home some day, but for now I am happy with this small piece on my desk. The larger bases are perfect for craft brushes and pencils. Such a great way to recycle those ... clever!!! these repurposed trophies into pen holders are really clever and cute.